The plan and intention had been, from that point, to build a complete project of well crafted music that would make their “peers proud but also to put an indelible stamp on this game” with their own original hip hop and unique focus. For those who waited patiently, or were mildly curious or indifferent..wait no more. 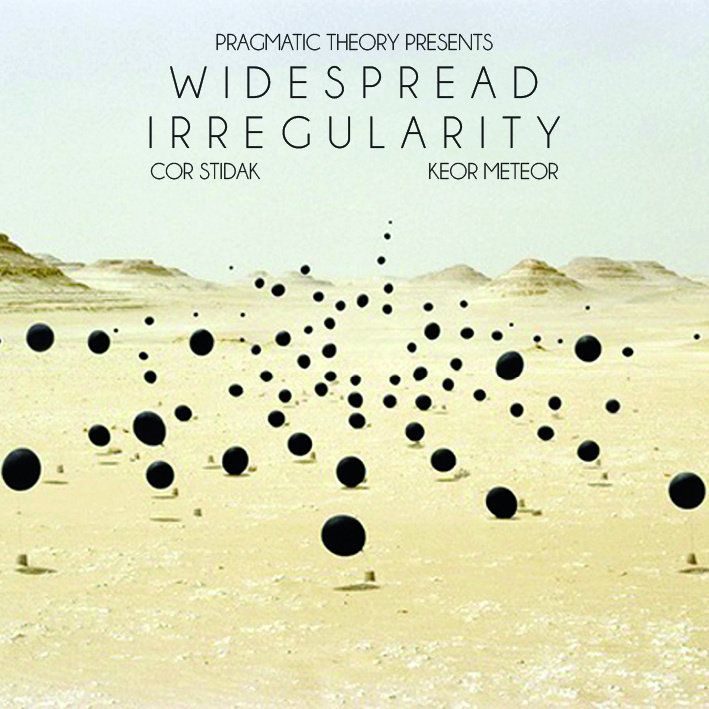 From VA to Paris to the UK and straight to the soul, Cor Stidak, Keor Meteor and Pragmatic Theory offer “Widepsread Irregularity.” There are cameos by Virginia emcees El RaSun and Cordova on the tunes, “Pearls” and “Elixirs,” respectively. Stidak trades bars with two underground generals, New Jersey emcee Light and Slim Pickens from Boston on the wildout “Triangle Choke.” And with a styled out nod to roaring ’20’s cool, the lovely and uber talented Alexandra Bautista makes you fall in love with her creamy yet edgy soul stylings as she pairs with Stidak and Meteor on the polished, “Vermillion.” Clearly, the guys haven’t forgotten or neglected one of the essential hip hop elements–the DJ, as there is also some fine turntablism on display on a number of the cuts. Those duties were handled by RenRok, Delight and DJ Ivan6. Quite the lineup. It may be hard to believe that on the cusps of previous releases by Stidak, Meteor and Pragmatic Theory that this album of 9 vividly dark jewels would be made FREE to download. But it is. Enjoy. And just hope we don’t have to wait another 2 years for more.” – A.G.